Leaving the farm in the heat of the day, Ray encounters flightless emus looking for shelter from the sun. He’s lucky he can get this close, as emus could run away at 50 kilometres an hour! Ray reaches a waterhole in the foothills and settles down in a hide. Again, Ray and his cameraman are lucky and they spot three different kinds of kangaroo – the Euro, the Grey and, finally, the Red. 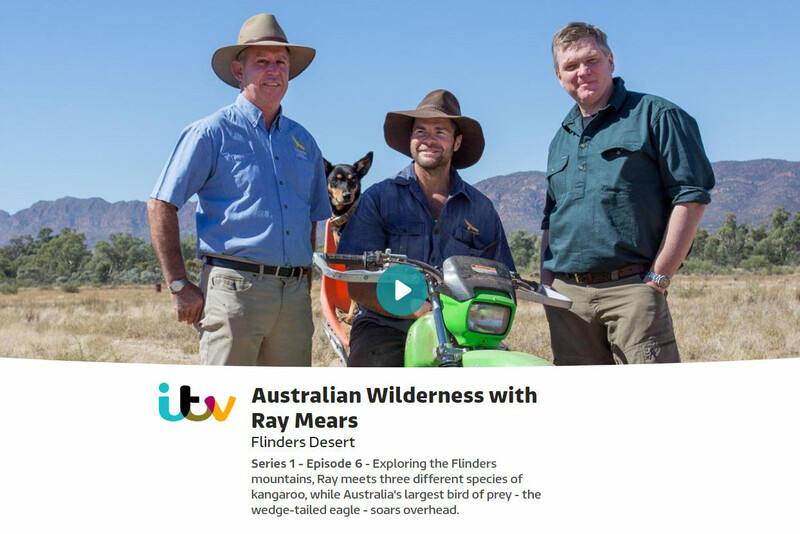 Moving higher into the mountains, Ray is looking for Australia’s largest bird of prey – the wedge-tailed eagle. In his quest, he gets a lift from bush pilot Paul O’Brien in his helicopter. Paul takes him to a peak called the Chace, where Ray hopes to spot eagles riding on the thermal currents. On the slopes, Ray camps for the night and makes beer bread for the team on an open fire. In the morning, the camp and surrounding area is covered in the webs of the orb weaving spider, whose silk is the strongest of any spider. But Ray is on the look-out for a much bigger predator – the wedge-tailed eagle. And he spots one! These eagles are big enough to pick up an emu, and have been known to drive kangaroos off cliffs. Ray ends his trek to Flinders Ranges with another helicopter trip to Wilpena Pound, where the early settlers tried to keep cattle. But the climate was too much for them, and the peaks have been left to the eagles. Yeah, that along with a lot of other statements had me puzzled. Is this stuff all made up?, or did you get some of it out of tourist brochures? Although I can’t imagine what brochure would claim the Flinders Ranges is Australia’s largest, given that The Great Dividing Range actually lives up to its name, running the entire length of the East Coast and down through Victoria with Mt Kosciusko over twice as high as the highest point in The Flinders. Whilst I sort of enjoyed the series, the claim to go to unexplored areas is contradicted by the footpaths, helipads and endless tourist guides. I was waiting for Ray to “discover” the Sydney Opera House steps! Could you please tell me what makes the flinders “Australia’s largest mountain range?”. It’s certainly not the highest or the longest. Also as you rightly pointed out Australia is a continental landmass not an island even though you call it the world’s largest island. Finally, you said Australia is one-fifth of the worlds landmass. Last time I checked Australia was about 5% of the worlds landmass area or 1/20th if you prefer.